BANGI, 24 July 2014 – The European Central Bank’s (ECB) proposal for a banking union in the European Union (EU) in January 2015 will be risky because it may be used to make emergency bail-outs to aid central banks of member states – something it was not supposed to do. An economist from the University of London, Professor Dr John Driffill said he has reservations about the move unless there will be improved supervision, uniform regulations and a move towards single market and financial services. He expressed concern that the banking union might compel the ECB to become a lender of last resort to member states with faltering economies in dire need of a financial bail-out judging from what happened at the last financial crisis in 2008. Prof Driffill, from the Department of Economics, Mathematics and Statistics, Birkbeck was speaking at a seminar onBanking Union: Better Than Expected? organised by The National University of Malaysia’s (UKM) Institute of Malaysian and International Studies (IKMAS) here today. He said he was worried that the ECB will lean too far towards accomodating weak central banks. Prof Driffill said the ECB is already the largest creditor of the fragile banks and has accepted large amounts of low-quality assets as collateral, issuing nearly 80 percent of the Euro system’s monetary base via the banks of the six crisis-afflicted countries: Greece, Ireland, Portugal, Spain, Italy and Cyprus, which account for only a third of the Euro countries’ GDP. Prof Driffill said the proposal echoed similar past attempts at coordinating and unifying the monetary system of Europe. “How often have we been here before? Previous schemes with lofty ambitions – the Euro, for example – have had spectacularly unexpected consequences. How will the banking union concept turn out in practice?” he asked. He said the less wealthy EU states may not feel obliged to reform their economies when they know that they will likely get a bail-out to rescue their central banks. In time, the financial crisis would become more serious as the banks become less cautious and make very risky investments, as they feel that the ECB would always be there to help them if things go wrong. He said the consolidation of banks in 2008 had actually made the problem worse because the EU would not allow the more established banks to go under, a phenomena known as the “too-big-to-fail” syndrome. The EU’s proposals for the banking union have made surprising progress, despite widespread scepticism and opposition from some influential quarters. Nevertheless the ECB is seen as a permanent solution. Prof Driffill specialises in international macroeconomics and labour economics. 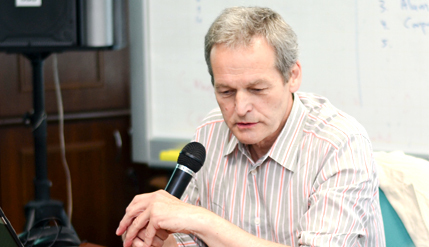 He co-created the Calmfors-Driffill hypothesis with Lars Calmfors, which states that there is a non-linear relationship between the degree of collective bargaining in an economy and the level of unemployment. Specifically, it states that the relationship is roughly that of an ‘inverted U’: as trade union size increases from nil, unemployment increases and then falls as unions begin to exercise monopoly power. The talk was organised by the Centre of Occidental Studies (IKON) of IKMAS under its European studies programme which is currently being developed. Present was IKMAS Deputy-Director Prof Dr Tham Siew Yean and Senior Fellows Assoc Prof Dr Zarina Othman, Dr Sumit K Mandal and Dr Jaroslaw Suchoples.